Some months are more of a challenge than others. Like this month. 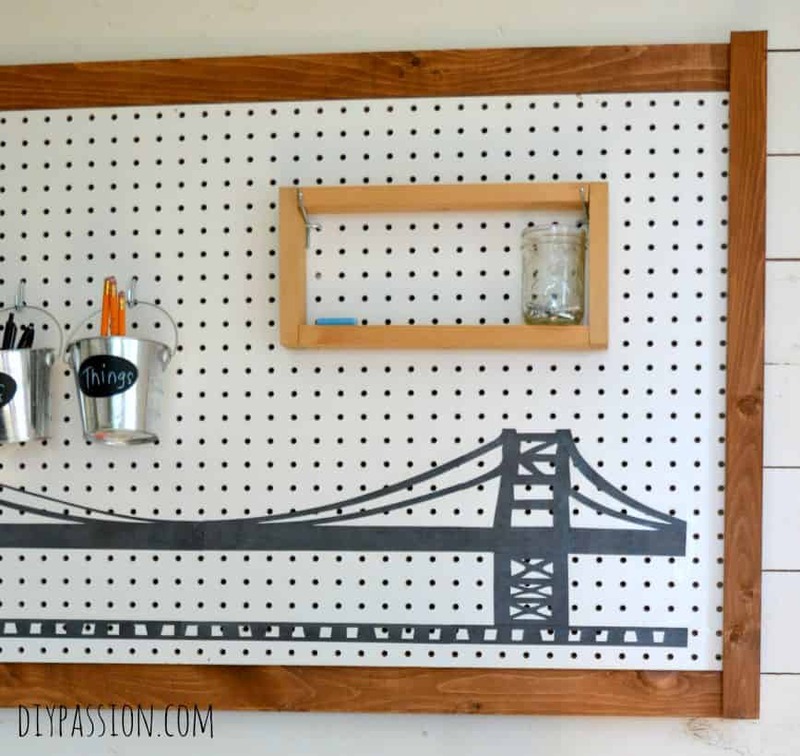 September’s item is Peg Board. 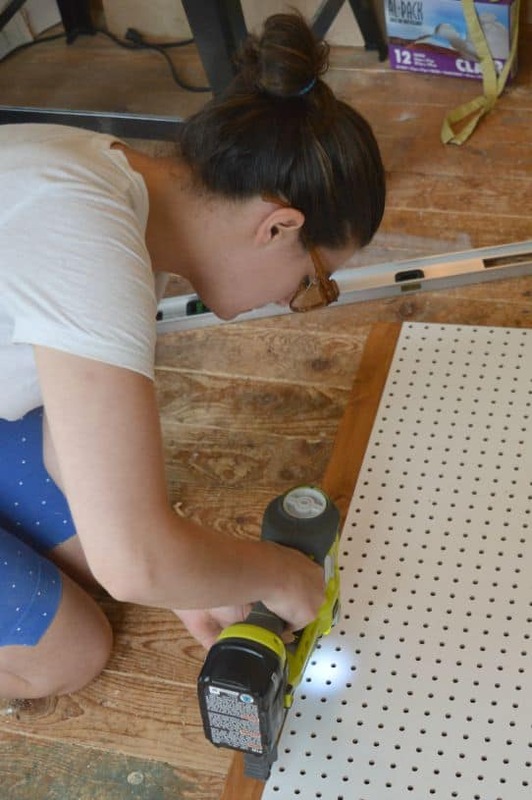 Here’s what we started with – a 4×2 peg board from the hardware store that cost us about $8. Then we had a few pre-sanded and cut boards of varying sizes and lengths. At first, it was sorta weird. Basically they are like baby wipes saturated with stain. 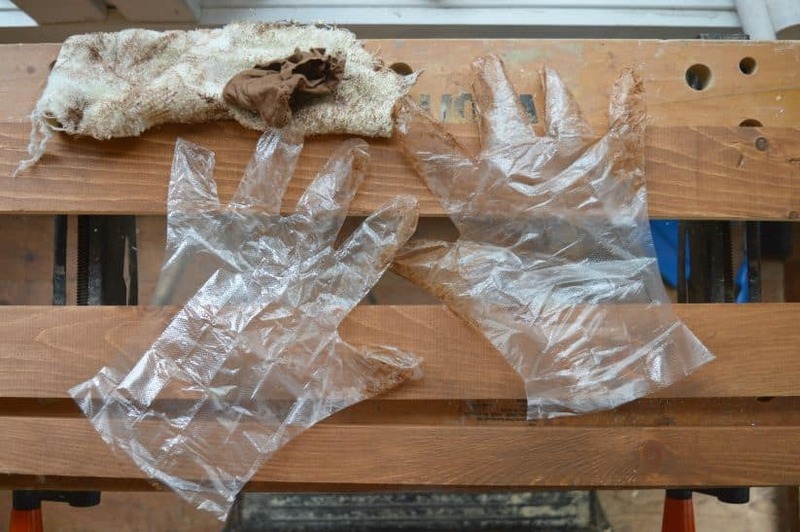 But a few minutes in, I realized how much tidier and simple this process is with wipes! Then, I used the wider boards (which were both 4′ lengths) and affixed them to the back of the peg board. I allowed 2″ of them to show through at the bottom. I attached them with my nail gun and it was a breeze. 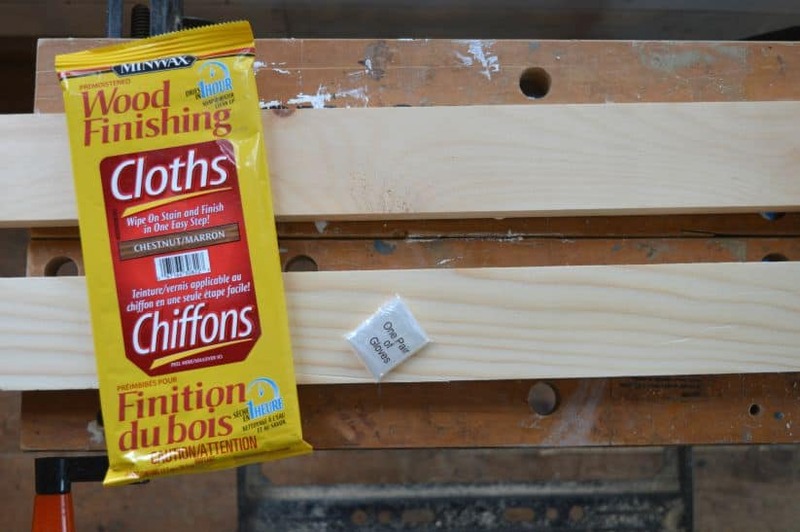 From there – I measured the length of the side of the peg board from the top of one board to the bottom of the other. It was 28 1/4 inches in case you were wondering. Now to up the nautical factor. 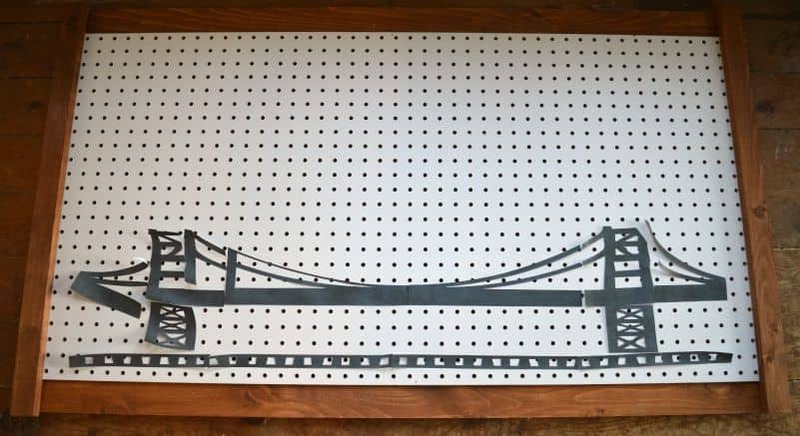 I searched through the Silhouette Design Studio and found a file image of a bridge span. I cut the bridge out of scrap booking paper in a grey-black tone. 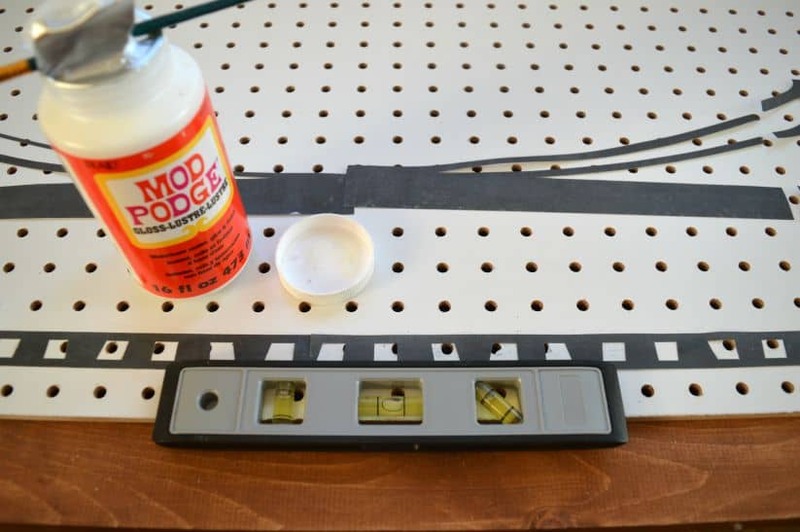 Once I had my bridge all cut, I laid it out onto the pegboard to visualize how I would stick it down. Using a level and a small paint brush, I glued the bridge down piece by piece. It wasn’t really that difficult – just required a bit of attention to make sure things stayed as straight as possible. Where the seams really showed through, I used a fine-tipped black marker to colour them in! You know what’s amazing? That Dan actually said he thinks this is cool. This is great! I am glad the paper cutting robots didn’t get the best of you. I really like the bridge and can tell you worked hard to get the exact look you needed! I love it! (Also I’m super impressed that you use a circular saw… I’m still too chicken!) So glad you got the Silhouette thing figured out – dumb registration marks! I’m seriously impressed you cut out something that big – I’ve never done something like that before and it looks FANTASTIC! Wow! 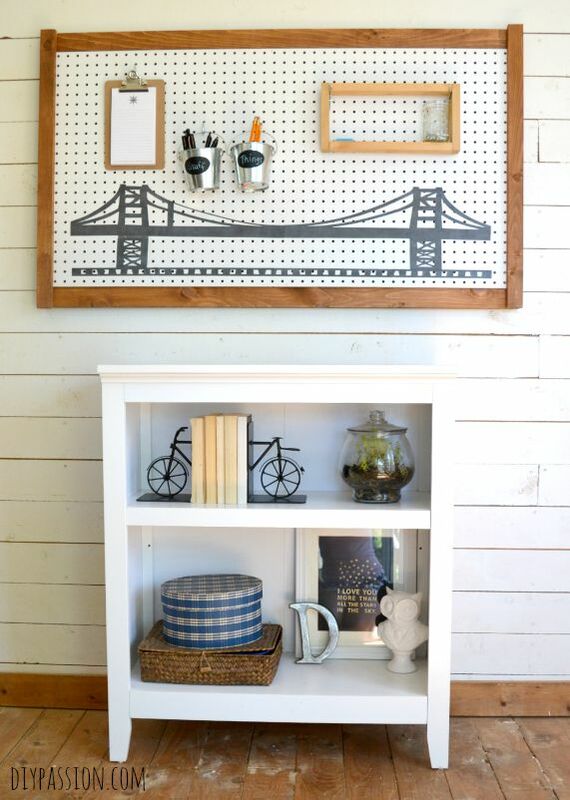 This is one of the most creative peg board displays I’ve seen. Kinda reminds me of the Lite Bright from the 80s. 🙂 Who knew what creative magic it would work for the future. Dan better like it! haha. Perfectly masculine and perfect for an office! 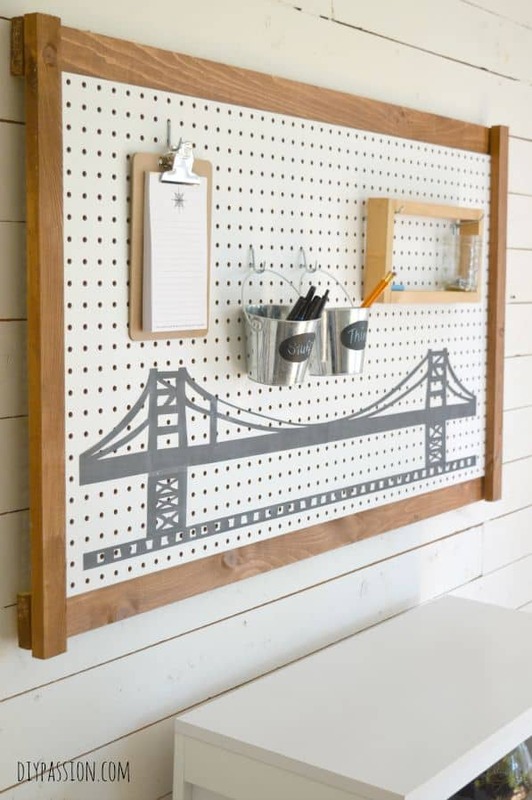 What a fabulous pegboard for a home office! The bridge silhouette idea is very creative. I am impressed that you cut all those little bits out of paper! I think that would have done my head in! The final result looks beautiful. 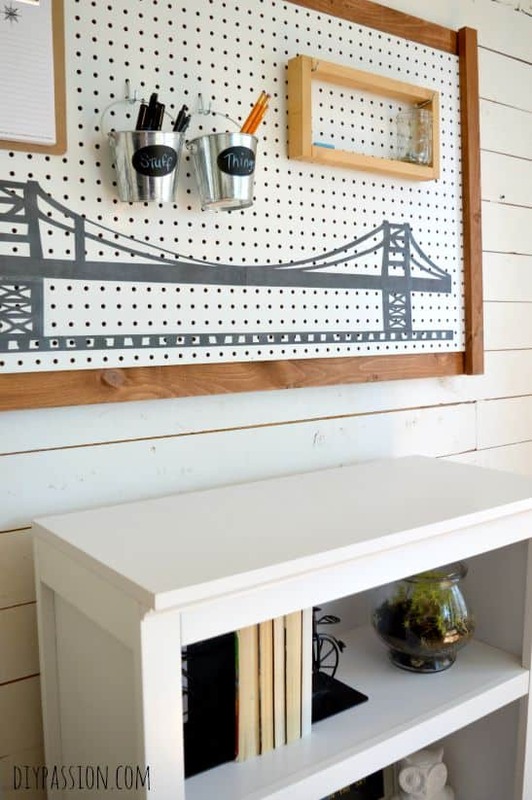 Love the bridge silhouette – looks great. Thanks for linking up to Pin Worthy Wednesday, I have pinned your post to the Pin Worthy Wednesday Pinterest Board.